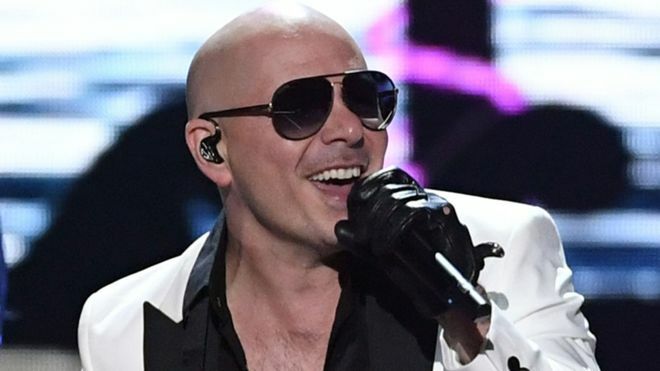 Pitbull has been praised after sending his private plane to hurricane-hit Puerto Rico to transport cancer patients to the US mainland. His good deed came to light after Jenniffer Gonzalez, Puerto Rico’s representative in Washington, thanked him on Twitter. He told the New York Daily News he was “just doing [his] part.” “Thank God we’re blessed to help,” he was quoted as saying. Much of the US island territory has lost its power after being ravaged by Hurricanes Irma and Maria. Almost half of its 3.5 million residents are without clean drinking water, while hospitals are running short of the diesel needed to power their life support systems. At least 16 people are known to have died from the effects of the most recent hurricane. Writing in the Hollywood Reporter, Hamilton creator Lin-Manuel Miranda urged people to donate to the recovery effort. “Puerto Ricans need supplies and resources just as badly as their fellow Americans in Texas and Florida,” wrote the composer and performer. Daddy Yankee, singer of worldwide hit Despacito, has also called for donations, as have Oscar winner Benicio Del Toro and talk show host Ellen DeGeneres. Bruno Mars, Ed Sheeran, Edward Norton and Jada Pinkett Smith are among those who have so far signed up to the initiative, which aims to bring relief to all those affected by “recent natural disasters”.